Last year North Carolina enacted Susie's Law. Susie's Law makes any malicious abuse, torture or killing of animals a Class H felony, punishable by up to 10 months in jail. Now the first prosecution under the new law is underway in Caswell County. According to the Animal Law Coalition, Jimmy Lee Spears, Jr. has been charged with 3 felony counts under Susie's Law. Spears is alleged to have starved 3 dogs to death while they were left chained. That doesn't begin to describe the intense suffering of these animals as they slowly died. Animal lovers throughout the country will be watching to see what happens as Susie's Law is put into practice. Susie's Law is named after a dog who survived incredibly wicked abuse. 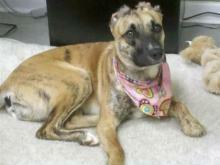 Susie was just an 8 week old puppy when she was tortured, burned and left to die in Greensboro, NC. According to the Greensboro News & Record, her ears were burned off and she was covered in maggots by the time she was found, about two weeks later. the perpetrator of the abuse was caught, charged, convicted, and sentenced to probation. Susie's new owner, Donna Lawrence, was one of the leaders of the movement to create Susie's Law. Lawrence wanted to make sure that anyone who tortured a dog would have to face jail time.